As the rain cleared to give way to a lovely, temperate day, the streets of Dublin city centre bloomed with vibrant colour as over 40,000 women gathered for the start of the 2014 Women’s Mini Marathon. 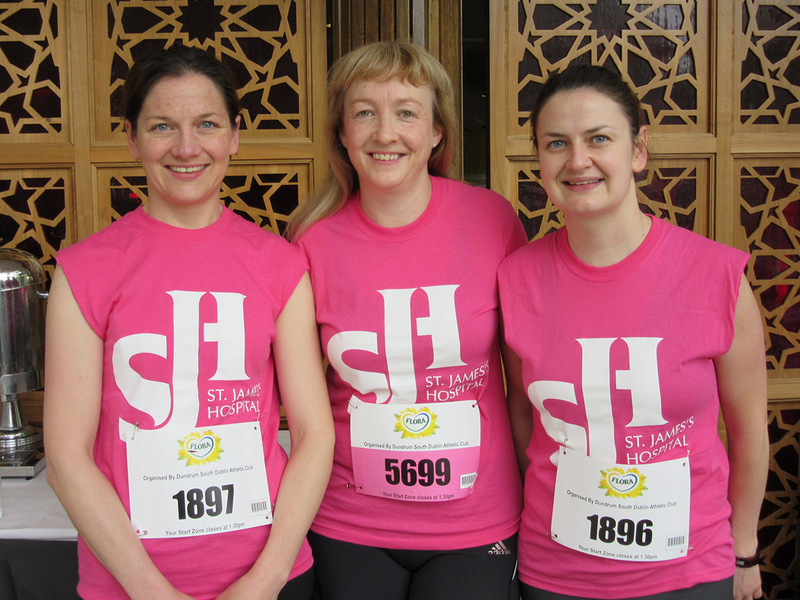 Congratulations and thank you to all the amazing women and ‘ladies’ – over 300 of you – who ran, jogged and walked on behalf of St. James’s Hospital and added to the colour in your fuchsia pink, SJH t-shirts! It was a privilege meeting you all, to welcome old friends and to see new faces. We hope you enjoyed the day – the run, the post-race tea and chat, raffle and massages from the physiotherapists from the hospital’s physiotherapy department – a huge thank you to the physio team for giving so generously of their time, knowledge, skills and good humour. On behalf of St. James’s Hospital Foundation, we would like to thank our sponsors whose contributions helped to make the day such a success: the O’Callaghan Hotel Stephens Green for their wonderful hospitality and generous gift; Weleda for their Arnica Massage balm used during the post-race massages and for their beautiful prizes; Cornmarket for their sponsorship of promotional materials; and Alan Keville for Hair for their generous prize and incentives. Once again, thank you to everyone who took part and for raising funds for a speciality or department close to your hearts. We deeply appreciate your commitment and the effort you put into this event on behalf of St. James’s Hospital. Remember, everyone who raises €150 or more is entered into a draw to win a night’s B&B for two at O’Callaghan Stephens Green Hotel; to be eligible all sponsorship must be returned by 5pm on September 30th 2014.